Im still not sure what show you're describing, but I'll toss a guess at DinoRiders anyway. is it me or do you look back at these show's titles and go "what the hell were they thinking?" Ah, no wonder, that show came out in 97. I was digging up things from about 87. I've never heard or seen Extreme Dinosaurs before. I owned (and still do somewhere) the pteradon in the upper right corner. LOL I only had normal dinosaurs! 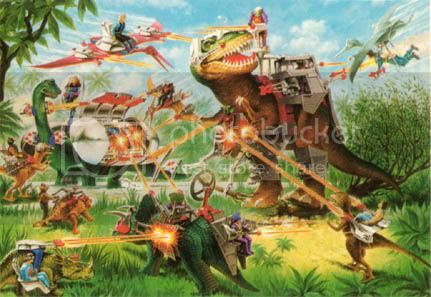 Hey I remember dinoriders too. Was big on the dinos back in the day, aspiring paleontologist. I am the key master! It's the new generation ninja turtles show which is sadly fading away into the weeeeee hours of the morning. The triceritons are like this war bent aliens in giant space stations fighting against a different and more advanced militaristic human race. I just had to get this out, seeing dinosaucers and others come into this was killing me. So uh....what happens when your creature won't stop jumping off cliffs like crazed lemmings?